A new geology field school opened in County Clare today is expected to draw students from all over the world to the limestone karst landscape of the Burren. Developed by the Burren and Cliffs of Moher Geopark, in collaboration with Caherconnell Archaeological Field School and NUI Galway, the Burren Geology Field School will teach students about the world-class geology of the Burren and how the region has been changed over millions of years by floods, tsunamis, earthquakes and ice ages. The School has today welcomed its first students, a group from the Department of Earth and Atmospheric Sciences at Metropolitan State University of Denver, Colorado, USA. During their fortnight stay in the Burren, the students will attend classes at the Burren Geology Field School in Caherconnell and undertake daily fieldtrips to sites of geological significance. They will also earn credits towards their US degrees as a result of their studies in Clare. The tutors facilitating visiting students include Dr. Eamon Doyle, Geopark Geologist; Dr. John Murray, NUIG’s Earth and Ocean Science Department; and Colin Bunce, head of field studies with the Burren Outdoor Education Centre. “The geology of the Burren and the dramatic changes experienced by the landscape of the region down through the millennia has long been a source of interest for geologists and academics throughout the world,” commented Carol Gleeson, Project Manager, Burren and Cliffs of Moher Geopark. “The underlying geology of the Burren holds many fascinating clues to conditions on Earth more than 300 million years ago. More recently, the last ice Age which ended only around 12,000 years ago, has sculpted those rocks and largely given the Burren its current shape. “Research is active and scientists and students come from all over the world to see what we have here. This new field school however, provides academics and geologists with a focal point to undertake their studies,” she added. According to Ms. Gleeson, the new field school continues the Burren’s tradition of being a place of learning for many hundreds of years. The O’Davoren Law School at Cahermacnaghten from 1500 onwards and the earlier Ó Dálaigh Bardic School at Finavarra are well documented examples of places of learning. More recently, third level students from all over the world have used the Burren as a place to learn in many diverse disciplines. 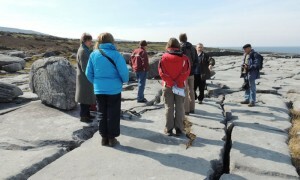 Maintaining the link and tradition of the older Burren Law and Bardic schools, Caherconnell Fort is now the site of a growing archaeology and geology summer field school, while the Burren Outdoor Education Centre has been providing secondary schools with field-based geography courses for many years.